Dearest Readers, Watch Me Eat My Words! 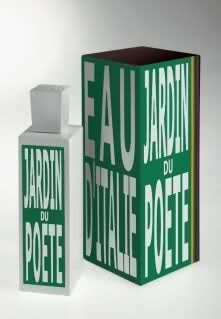 "Green was the silence, wet was the light, the month of June trembled like a butterfly..."
Oh how well that describes the sumptuous, soulful, summery deliciousness of Bertrand Duchaufour's new scent for Eau d'Italie, Jardin du Poete. I usually like my green scents dry, sharp and coldly bitchy. This one is a departure for me; it is soft, juicy and quietly joyful, as if lit from within by a warm glow of happiness. It doesn't sparkle (sparkle is a four letter word), it delicately glimmers. I love the pulpy lusciousness of the orange note in the top, it is so realistic and ripe that it makes me want to bite into it greedily. What I also love is that the note, however, is not overly sweet. The presence of more acerbic grapefruit and gently piquant pepper keeps the sweetness in balance. Basil is one of my favorite green notes (and favorite herbs); often it smells spicy, particularly when used in masculine perfumes, but here it has a tinge of fresh, slightly cool, woody sweetness. Immortelle plays into that woody verdancy, at the same time lending the scent more body, fleshing it out, making it more comfortingly solid. Although this tender, indeed poetic composition does in fact, metaphorically speaking, "tremble like a butterfly", it wouldn't have been Douchafour's without a darker, drier, earthier base, thanks to cypress and vetiver. All in all, a beautiful, harmonious celebration of summer, a fitting offering to Apollo. Available at LAFCO New York and sirenuse.it. Love this description, Marina. Now I want me some pulpy orange! Looking forward to trying this. I love basil too. I get a very watery feel with Jardin. Do you? @olfactoriastravels.com: I get that watery feel, too, and I fear that will be a spoiler for me. What a shame, I was so looking forward to the scent and was sure that I would love it given the notes. I love it when you quote Neruda. :) This sounds so pretty -- that both you and Birgit like it makes me definitely want to sample this one. I am helpless when you quote Neruda. Thank you! Am looking forward to reading our review. To me it's not watery at all. It is moist. I don't know if that makes sense. FdL was watery indeed. Ooh, basil, one of my very favorite things in the world! I will have to test this one for summer.